I've always said that my favorite part of being Editor–in–Chief is the opportunity to create for other people the same experiences that shaped me. In the last job interview of my recruiting season, I was asked for the first time to identify my biggest strength and weakness. Volver, Jose Garces' new tasting menu restaurant in the Kimmel center, features a separate bar area with killer eats and livable prices. Did you know that Harvest has outdoor fire pits? Me neither. Until last night, that is.I'm a Tap House girl; always have been, but I'm not sure how long I will be. Enjoy the firsts while you can. You know that feeling when you’re not yet sick but the back of your throat is a little scratchy and you have to blow your nose when you wake up and you know you’re about to come down with a quarantined– in-bed–level cold? I don’t really like fling. There I said it. Maybe I’m in the minority, but I will stand by my opinion. Street is mad. Street is very mad. 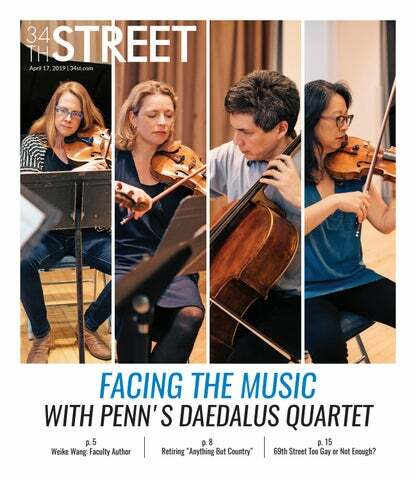 Street was denied press passes for the SPEC Spring Fling concert and THEN Street found out that Penn was flipping everything we know and love about Fling upside down with its rules and threats and undercover officers who may or may not be hot girls with fake PennCards. But then Street (I) walked to the art museum along the Schuylkill River Trail and the sun was shining and people were rollerblading and it was just so frickin’ hard to be anything but effervescently happy. This week Street is talking about the one thing you’re not supposed to talk about. Welcome to Street’s first annual Style Guide, the chicest issue of the year. Most of my spring break was spent in a bubble bath with three of my best friends. Upon arriving in Montreal, where the drinking age is 19 and the dollar is strong, we were probably most excited to discover that our hotel room included a large Jacuzzi tub. In part two of my tween–obsession saga (for those of you following along, yes, I’m still listening to One Direction), I have a crush on a group of teenage–boy Vine stars. Rereading that sentence made me gag a little. Yesterday morning I fell down five icy stairs on my back porch. It was incredibly painful. I sat there, alone in the cold, clawing for my phone, for two freezing–cold minutes. As the Editor–in–Chief of an arts and culture magazine, I feel it is both my civic and editorial duty to admit that I have fallen under the spell of One Direction. Yesterday I went downtown to treat myself to a haircut and some much needed off–campus alone time. Seated comfortably in the safety of the rear¬–most station, I was ready to let my mind wander from the consuming topics of the Penn bubble.